Buck, a 297-pound Saint Bernard, was at one point the largest dog on record. 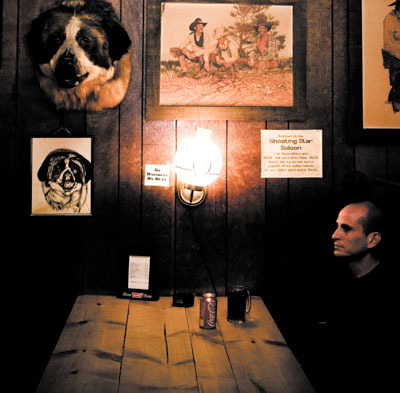 His head has been mounted respectfully on the wall of the oldest bar in Utah, The Shooting Star Saloon, since 1962. The Shooting Star Saloon started as a general store in 1879 in Huntsville, Utah. Hoken Olson, the original owner, was bootlegging and running illegal card games out of the basement. After several run-ins with the local authorities over the illegal gambling and selling alcohol without a license, Olson converted the store into an actual saloon. Over 100 years later, John Posnien is now the seventh owner. He bought the saloon 20 years ago because he needed a hobby. Very little has changed at the Shooting Star in all those years. Most of the décor was provided by customers throughout the years, such as Buck the stuffed dog, and several other fine examples of taxidermy. Dollar bills signed by customers paper the ceiling, while articles about the Shooting Star and photographs of their customers cover the walls. A collection of business cards put up by businessmen spanning the last 30 years surround the bar. Posnien has a unique business plan: "Keep it simple and do it how it's been done." He must be on to something, considering the Shooting Star has outlasted any other bar in the entire state. In the spirit of keeping it simple, the Star is a beer bar offering up several Wasatch and Uinta beers. The Star does not except custom orders. They just don't do it. Who is to question this when the place has been around for so long? Not changing the menu is an essential part of Posnien's business plan. The Shooting Star's menu is surely something to behold. They have the Shooting Star burger, which consists of two hamburger patties, topped off with a Polish sausage, a hunk of cheese, and a secret sauce jam packed with warm hearty goodness between two buns. That is for those of you who really like meat. If you are kind of into meat, then they have a hamburger. When asked what they do for vegetarians, Carol Conway, who has been working at the bar for over 20 years, will usually respond: "We eat 'em!" Oh yeah, there are also chips. The Shooting Star's unique atmosphere and giant burgers bring people in from all over. "You can get anyone in here from bikers to five-star generals to nuns," Conway said of their customer base. "Our regulars are travelers; guys who come in from Idaho or other places. Some nights, you will hear several different accents and languages." The town of Huntsville is small and the people are homey. You wouldn't expect the local bar to be a place where the local nuns would go have lunch, but it happens. Posnien has done a lot to clean up the Shooting Star's reputation. It has become a respectful business and a central part of the community. "There was a time that people wouldn't even walk on the same side of the street as the bar," says Posnien. "But now it's a place where people can be comfortable and everyone is welcome." If you find yourself in the mood for a nice drive and a beer head North and up either Weber or Ogden Canyon. The Shooting Star is open Wednesday through Saturday from noon to 11 p.m. and Sundays from 2 to 11 p.m. You can track them down at 7350 E. 200 S. Huntsville, Utah. Don't look for a web site, because they don't need one, and they do zero advertising. If all else fails and you can't find it, give them a call at (801) 745-2002.